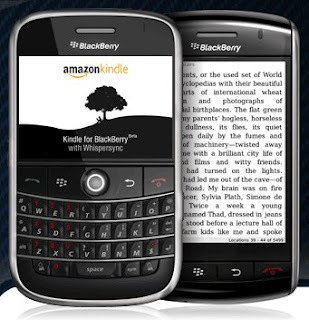 Amazon is now offering its Kindle App for BlackBerry users. Amazon online retailer and reseller are already elaborated with Amazon Kindle Applications that let people read books on the Windows Computers, Apple iPhone Touch and Apple iPod Touch, but customers have to purchase rights of particular books to read it on any of these devices. Amazon has now included Black Berry Smartphone in this list; So Black Berry users can also read books on their smart phones. Amazon will soon include Apple Macs and Apple iPads in those lists, But Amazon didn't mention any news about including Android smart phones in press releases. "Since the launch of our popular Kindle for iPhone app last year, customers have been asking us to bring a similar experience to the BlackBerry, and we are thrilled to make it available today"
Amazon Kindle Application is now supporting seven models of BlackBerry Smartphone’s listed below.